Sun Valley patrons had a hard time finding parking in 1984. Image: Dale Brazao / Toronto Star / Toronto Public Library, Baldwin Collection, Item TSPA 0015148f. From fruit to fish scalers. Image: Google Maps, July 2016. Danforth & Gough, 1984 and 2016. In August 1984, the Toronto Star reported that 40 people from the surrounding neighbourhood had taken Sun Valley Fruit to the Ontario Municipal Board to force them to provide parking. Michele Mandel explained in her report that Sun Valley had moved into an old Metropolitan Store1Architect might have been either William Sutherland or Samuel Kohn, but I have no evidence. and opened 24 hours, leading to an increase in traffic in the area. The ultimatum was reputedly to provide the parking or leave the neighbourhood.2Michele Mandel, “Traffic chaos angers store’s neighbours,” Toronto Star, August 1, 1984, A6. For its own part, the store felt that the charges were both ridiculous and perhaps suspicious because the OMB appeal was lodged by a competing fruit market.3Paul Bilodeau, “Fruit stor’s lawyer calls opposition ‘suspicious’,” Toronto Star, August 2, 1984, A6. Parking wasn’t the only point of friction that the grocer experienced: its owners were also quite vocal about Sunday closing laws.4David Kingsmill, “‘Stupid’ Sunday law riles food merchants,” Toronto Star, February 18, 1987, F1. 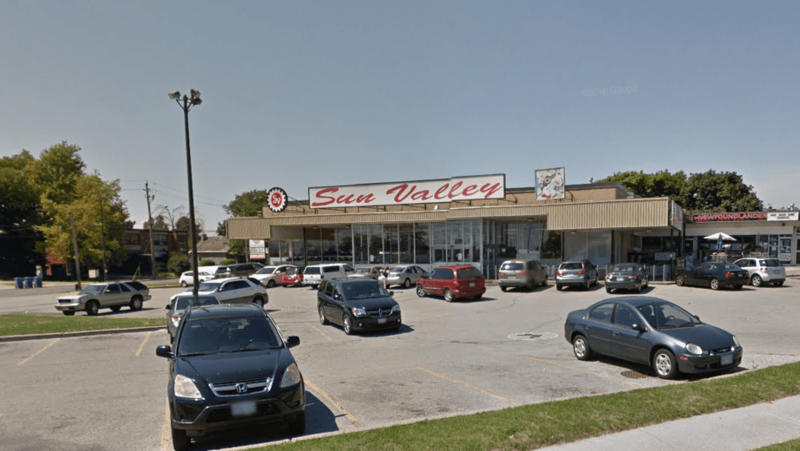 Sun Valley stuck around until 2012 or so, but had, in the meantime, opened other stores, including one at 468 Danforth Road (at Birchmount Road in Scarborough), located in larger-format store that was once a Dominion. The space in Greektown is now occupied by Kitchen Stuff Plus. Image: Tony Bock / Toronto Star / Toronto Public Library, Baldwin Collection, Item TSPA 0015183f. Image: Tony Bock / Toronto Star / Toronto Public Library, Baldwin Collection, Item TSPA 0015184f. 1. ↥ Architect might have been either William Sutherland or Samuel Kohn, but I have no evidence. 2. ↥ Michele Mandel, “Traffic chaos angers store’s neighbours,” Toronto Star, August 1, 1984, A6. 3. ↥ Paul Bilodeau, “Fruit stor’s lawyer calls opposition ‘suspicious’,” Toronto Star, August 2, 1984, A6. 4. ↥ David Kingsmill, “‘Stupid’ Sunday law riles food merchants,” Toronto Star, February 18, 1987, F1.